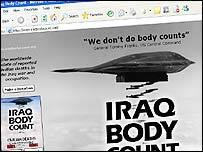 The website Iraq Body Count is involved in a war of words with 'media-watchdog' Media Lens. Iraq Body Count, Media Lens says, vastly underestimates the number of deaths in Iraq thereby aiding - unwittingly or otherwise - those who defended the war. In this unedited transcript of an interview with the BBC's David Fuller, the man behind Iraq Body Count, John Sloboda, explains the site's purpose and methods and answers his critics. David Fuller: Why did you set up Iraq Body Count? John Sloboda: We were deeply deeply opposed to the attack on Iraq - for many reasons. But one of them was that we feared that there would be a great number of civilian deaths as a result of the invasion and what followed. And we also knew from previous experience in recently conducted wars of intervention such as Afghanistan and Kosovo that the coalition would not make any sincere efforts to count the number of people that they killed. We decided we had to do this as a sort of public watchdog on our own governments. DF: Your critics describe you as amateurs, how do you respond? JS: Amateur means several different things. Firstly it comes from the Latin - to love - so an amateur is someone who does something out of a deep personal motivation. In that sense, absolutely, we are amateurs, rather than apparatchiks in some large organisation being paid to do this who don't care about it. We care about it passionately and deeply. That's not the way in which Media Lens are using the word, they're using to say 'incompetent', 'not up to the job'. In that they are claiming that to do this work requires some kind of specialised training, some kind of accreditation by some other body. Our position is, and always has been, that reading press reports, which is what this job is, requires nothing other than care and literacy. The whole point about it is that it doesn't require statistical analysis or extrapolations. Can you do that well, can you do that badly? Of course. We believe we do it exceptionally well, so the implied claim that our work is shoddy or inaccurate is - in our humble belief - nonsense. DF: Your critics claim that your work is a vast undercount, how do you answer that? JS: The claim (that our work is a vast undercount) is made basically on the back of some quite shaky extrapolations from a single study that was carried out with a particular methodology in 2004. That is the celebrated Lancet study. It sampled just under 1,000 households scattered over Iraq. The study found a small number of war-related deaths in those families - I think the number was in the tens. And then multiplied that number through by a factor to say if that sample represented the total population of Iraq then this is what you'd expect. Anyone who knows anything about sampling knows that the smaller your sample the less confident you can be in the extrapolation - so you have to put what's called a confidence interval around your estimate. So the central estimate in the Lancet was 98,000, but the confidence interval, which is the range in which you can be 95% sure that the real answer lies spanned between 8,000 at the low end, to 198,000 at the top end. Some critics of the Lancet study have said it's like a drunk throwing a dart at a dartboard. It's going to go somewhere, but who knows if that number is the bulls eye. Unfortunately many many people have decided to accept that that 98,000 figure is the truth - or the best approximation to the truth that we have. Now that might be OK if there were no other studies. But there have been. A much much larger survey of the same kind that the authors of the Lancet report carried out, was commissioned by the United Nations development programme - the Iraq Living Conditions Survey. I think it surveyed 20,000 households with a much better geographical sampling technique. Their study comes up with a central estimate of 24,000 dead - up until three months before the Lancet study was finished. So there is an adjustment to be made - but when you make that adjustment - it brings it up to 28,000 in comparison with the Lancet. The confidence interval around that second study is much smaller, something like from 18,000 to 30,000 - something like that. DF: Should this have made people question the Lancet report? JS: It should have caused people to just stop and think. This is like a complex jigsaw and you have to look at many different things to get a full picture. The Lancet report included more categories of death than the UNDP study. The Lancet included deaths from accidents, from illness as well as direct war-related deaths. There is data within the Lancet study that allows you to disaggregate illness and accidents and everything else. When you do that, the central estimate for violent deaths is 57,000. Already you've nearly halved the number when comparing like with like. You can take further adjustments, and what you find is that it's a greater estimate than the UNDP, but not by that vast amount. And it's still outside the UNDP confidence interval. If you put these side by side and say which do we believe, I think most reasonable people who had read both studies properly would say that the UNDP is the gold standard because of their larger sample. If you take that as the gold standard and recalculate the relationship to our work the differences are much much smaller. Our work probably provides and estimate that is more than half that of the UNDP. We've always said our work is an undercount, you can't possibly expect that a media-based analysis will get all the deaths. Our best estimate is that we've got about half the deaths that are out there. Quite different from the claim that we're under by a factor of a thousand percent. DF: Doesn't the fact your work relies on western media reports undermine it? JS: I think many of our critics don't read our website. I think they believe that what we have on our website is a record of deaths directly witnessed by journalists. If a government spokesperson makes a statement, an official release, and someone from Reuters or the BBC reports that - that gets into our database. So it's not a question of - can a journalist get to Falluja - no journalist can get to Falluja, but there is some kind of infrastructure there - there is a local government, there is a morgue, there is a hospital... people in Falluja can telephone people in Baghdad with data, people in Baghdad can relay that to journalists. Our critics are basing their criticisms on a complete misunderstanding of how journalists work. There is somehow this view that there is this other source of information out there which is recording vastly more deaths than the western media. One of the criticisms made is that - if only we were able to read Arabic, and could scan the Arabic media, we would find this vast array of civilian deaths that the western media don't pick up. That is completely and utterly false because we have never had over the entire three years, anyone show us an Arabic source that reports deaths that we haven't already got. In three years. In thousands of incidents. There are organisations that translate Arabic reports into English, and we see their data. The BBC scans these sources, if there's something important on one of these sources then I dare say the BBC would use it too. Anything that is published in reputable Arabic media - is known to the western media. The idea that there's some alternate universe there, where truths are being promulgated unknown to the west is based on a complete ignorance of how the media operate. The level of intellectual acumen that our critics apply to our data and other studies is sadly very lacking. A belief is established, for whatever reasons, and then people try to find any argument they can to fit that belief, and they don't try to examine the stuff for themselves. The greatest damage is done when people who have some kind of reputation within a reference group make these pronouncements. So for example the fact that people like John Pilger, like Les Roberts make these kind of statements on Iraq Body Count. Many people just take them on trust, because they respect their authority - they say if Les Roberts says something, if John Pilger says something, it must be true. John Pilger disputes these claims by John Sloboda. John Pilger and Les Roberts have been approached for their response to this. John Pilger disputes these claims by John Sloboda. We will never respect anything that any other person says, without checking the evidential basis. That's the whole purpose of our existence. We are a fact-finding organisation. If it's reported in the media, 60 Iraqis have died at such-and-such a place at such-and-such a time, we apply a set of evidence-based criteria to the assertion before we decide to publish it. So we're now applying exactly the same evidence-based criteria to our critics. Ok, our critics say we're a gross undercount by 1000%, what's the evidence that backs their claim? We examine that evidence and take it apart, and unfortunately, it all vanishes away. Why do people want to hold on to this large and probably erroneous figure? I think it has something to do with the frustration and anger and despair of the peace movement at its utter lack of ability to make any difference to what is going on in Iraq. In the short term at any rate, the anti-war movement has completely failed and I think the bitterness and the hurt and the anger and the frustration - which we share! - at how we have seemingly been completely unable to influence the way our governments behave means that we now turn on each other. It's absolutely typical, you know, I'm a psychologist, this is what happens. When a group is marginalised and criticised and feels powerless - rather than strategise together about how to approach power and try to reassert themselves - they start squabbling among each other. We have known that the Lancet figures were being extrapolated and used in erroneous ways for 18 months. As soon as the Lancet was published, people in the movement started using them in the ways we're now uncovering. We have felt, as members of a movement which we are politically aligned to, that it was not appropriate to bring those errors to public attention - we thought it would damage the movement. We kept quiet and kept on with the job. We thought the right thing to do was to keep monitoring, day by day, the rising death toll. It'd only now that this negative campaign has reached a point that people who have previously supported our work, used our figures, have begun writing to us to say - the arguments by Media Lens and Pilger have convinced us, we're going to take your banner off our website. We are particularly concerned with the barrage of negative comments that our respected media colleagues are now receiving. The BBC are being bombarded with a barrage of emails every time they use our figures. The Independent, the Guardian. Papers that could not be said by any stretch of the imagination to be rabidly right wing or pro war. In fact the main target of Media Lens are the supposed liberal, left-leaning press, as they have a particular agenda with these media outlets who they see as wolves in sheep's clothing. That they are pretending to be independent, pretending to have some sort of liberal, left-wing concern - that they are wittingly or unwittingly supporting the prevailing Washington/Whitehall consensus. That is doubly damaging to Iraq Body Count because - we believe - that some journalists are so fed up with getting these constant messages from these people that they might be tempted to say, it's less trouble not to mention IBC so I'll save myself all those critical emails. And that is what we cannot tolerate - that people with a political agenda are actually trying to stop the dissemination of our data in the media. It's a symbiotic relationship we have with the media - we take the information from you, collate it and organise it in a well-organised fashion for you to use. That is the relationship that these people can't stand. They're trying to make that relationship go sour, and we won't tolerate that. In the last three months they have had four - FOUR - weekly campaigns directed against us. If you think of all the wrongdoing that's going on in the world, all the terrible things that are happening, that this organisation should choose to return to us four times, beggars belief. Is there nothing more important to be doing in the world? Some people have pointed out that the tactics they are using are very similar to the tactics that have been very well honed by the far right in America. Bombarding with hostile emails, a character assassination - these techniques have been honed to perfection since the McCarthy times in the 50s. It's a campaign of attrition. They want to wind people up into such a state of anger that they instantly respond and say something that they later regret, because everything that we write to any of their supporters immediately gets posted on their message board and gets dissected. If we make a slightly incautiously worded remark, that remark is hoarded and kept and is then thrown back to us in some context. deeply resent having to spend any time on this at all. It's intolerable. DF: Couldn't you do more to stop your data being misused? JS: There are so many media sources that use our data that we couldn't possibly correct all the ways in which is is misused. But the errors we are being asked to correct by Media Lens are not just that of misuse. They are asking us to put on our website, "IBC, a vast undercount", and we're not going to do that. There is no evidence that this claim is true. DF: Is there a danger that your methodology will get less accurate as the media loses interest in Iraq? JS: It's possible that journalists could stop reporting deaths, but the actuality is that there are more separate reports of deaths filed every day now than at any time since the invasion. For example on March 20th this year there were 50 separate media reported incidents on that one day. There was never that level of reporting at any earlier time. So at some hypothetical time in the future journalists may get fed up and go home, but that hasn't happened yet. DF: How would you describe Media Lens? JS: They are a pressure group that use aggressive and emotionally destructive tactics. On the belief that the gravity of the issues they're dealing with justify that, and also on the belief that that's somehow effective. What they have been asking for is a debate. We have declined to participate as we feel they have in some sense broken the rules of polite and respectful debate. We did offer to speak in private with some of our critics, but what came straight back is - no that's just colluding with the things that the corporate media do behind closed doors - we are transparent, everything must be out in the open - there's no 'off the record' with us. You can't have a sensible relationship with people who retain the right to put anything you say to them in the public domain. JS: If you are in the position with a difficulty that needs resolving, you need the freedom to be able to explore that difficulty without that very exploration being used against you. Why is the world in the state it is? Because America won't talk to Hamas, America won't talk to Iran - so the whole thing gets done in public, as a public spat. An elementary knowledge of how human beings behave shows that there must be a private space in which you can build relationships - you cannot grow relationships in the glare of publicity. You cannot express your feelings, you cannot build up trust. Relationships are about trust and one of the absolute essentials in trust is the ability of either side to decide when things can be put in the public domain and when they can't or shouldn't. That's what it means to trust another person. You trust another person when you know they can make the judgement. When you ask someone whether a private conversation can be had and they say, no, then there is no basis for trust. We have done nothing to destroy that trust. The offer is on the table for a private, off-the-record conversation with these people to try and work out why trust has broken down - but we will not engage with these people in public. They sent us an innocent sounding letter in January asking whether we could answer certain questions about aspects of our methodology. We replied almost immediately. They published this really nasty piece about us on their website, quoting from the letters we'd sent them, pulling them out of context, distorting them, adding ad hominem arguments on top. their motives were never pure from the very start. they sent us this innocent-sounding letter already knowing their intention was to destroy us. their intention was there from the absolute beginning - 'we do not trust these people' - and it's for them to restore trust with what they do. Everything they've done since then has undermined our trust in them even further. Their behaviour is far worse than most of our right-wing or pro-war critics, who, on the whole, have behaved rather more honourably. These people, I trust them less than just about anyone else in the world, and they would have to do 50 to 100 times more in order to regain my trust. It's absolutely extraordinary - the Pilger article - which, all it's got for it is telling the world that I'm a music psychologist. [Name withheld], who is a quite vitriolic right-wing blogger, at the beginning of all of this, back in 2003, wrote a character assassination about body count in which he in the same breath mentioned John Pilger for having the temerity to suggest that the Americans were killing any civilians at all. We were branded - with John Pilger - as these ranting anti-American lunatics. it's a mirror image of the Pilger article. It's just utterly ironic - here is John Pilger being [Name withheld]. And we're getting it from both sides. The people on the hard right can't distinguish between us and the hard left, and the people on the hard left can't distinguish between us and the hard right. Their conceptual worlds are so black and white. I think it's because we don't fit into their worldview. The hard left and the hard right, they're both utterly rigid, and the stuff that's going on in the middle, they can't handle. They want certainty. They want something they can latch onto and say - this is what I believe. They like the sense of being a beleaguered minority. What's most chilling is if you look at people's allegiance to much more dangerous causes than either of our critics are adopting. This is also the mindset that draws angry young men towards terrorism. And it's ultimately self-destructive. DF: What impact do you fear their campaign will have? JS: It's already had an impact. Quite a lot of progressive organisations have removed, or threatened to remove their link to our work on their website, so we're losing support among the constituency that really matters to us. From the beginning, aside from the media, peace groups around the world have used our data. The idea that these critics will stop good people using our data is unconscionable. It's also hitting our pocket. The only money we get is through the donate button on our website. We have noticed a significant drop-off since these attacks have started. This can be weathered. What cannot be weathered is that the mainstream media should stop using our figures because it's just too much hassle. We have to put into the hands of responsible media the definitive rebuttal to our critics so that when they use our figures they can say - 'your criticisms are unfounded for the following reasons'. And that's what we've now done.